U.S. President Donald Trump meets with Fabiana Rosales, wife of Venezuelan opposition leader Juan Guaido at the White House in Washington, March 27, 2019. U.S. President Donald Trump says Russia “has to get out” of Venezuela, following the recent arrival of Russian military personnel in that country. “All options are open,” Trump repeated several times in response to a reporter’s question on Wednesday about whether the United States is willing to put “boots on the ground” to remove the Russians. Trump added that Moscow is well aware of the U.S. stance. Trump spoke to reporters at the White House alongside Fabiana Rosales, the wife of Venezuelan opposition leader and self-declared interim President Juan Guaido. She went into the Oval Office following a meeting with U.S. Vice President Mike Pence. Russia rejected the U.S. declaration, saying its actions in Venezuela were lawful and agreed with the South American nation's legitimate government, the RIA news agency reported. The Kremlin declined to comment on reports it has deployed Russian servicemen to Venezuela. The United States, along with dozens of other countries, have recognized Guaido as the country's interim president, while Russia has backed President Nicolas Maduro. 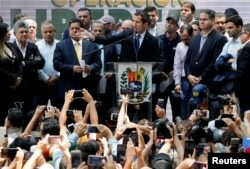 Guaido, in Venezuela on Wednesday, called on supporters to protest Saturday against nationwide power outages. Venezuelan opposition leader Juan Guaido, who many nations have recognized as the country's rightful interim ruler, speaks during a meeting with political leaders in Caracas, Venezuela, March 27, 2019. Maduro's cabinet ministers have accused the United States of sabotaging the electrical power grid, including a cyberattack on Venezuela's main hydroelectric dam. "Eighty percent of the population in Venezuela has no power," said Guaido's wife at the White House. "They are trying to break our morale. They want to submerge us in eternal darkness. But let me tell you that there is light, and the light is here." Efforts to move U.S. humanitarian aid into Venezuela from Colombia have not succeeded. "Maduro won't take aid," Trump said Wednesday in the Oval Office. "We've sent hundreds of millions of dollars' worth of aid to the border. He won't take the aid. He'd rather have his people starve than take the aid. I don't think that's good, even from a political standpoint, even from a dictator." Trump added that "this did not have to happen in Venezuela," blaming previous U.S. administrations for not solving the Venezuelan issue. "This is a tragedy." The president added that he had "inherited a mess" with Venezuela and other foreign policy matters. News reports say two Russian air force planes carried a Russian defense official and nearly 100 troops on Saturday into the main airport in Caracas. "Russia has various contracts that are in the process of being fulfilled, contracts of a technical military character," is how the Russian government-owned Sputnik news service characterized the flights, which it says carried officials to "exchange consultations." Some analysts view Trump's rhetoric, combined with the presence of Russian forces in Venezuela, as heightening the risk of a confrontation there. "The Russians are seeking to project power close to the U.S., as they have done in the past, and also show solidarity and support for the Maduro regime," said Michael Shifter, president of the Inter-American Dialogue, a transnational think tank. "The U.S. knows that Russia can give Maduro some oxygen and breathing space but lacks the capacity or will to save Venezuela." But should Washington eventually pursue a military option in Venezuela, Shifter predicted, "the Russians would not be prepared to protect Maduro." Shifter told VOA it is the highest levels of Venezuela's military that are essentially sustaining Maduro's hold on power. "The Trump administration should focus on that challenge, not by issuing threats and ultimatums to the generals, which hasn't worked, but rather by trying to arrange and facilitate serious negotiations to strike a deal that would pave the way for a democratic transition," Shifter said. It's certain to be a complicated, difficult task, he added, "but without it, it is hard to have much confidence that the crisis can be resolved."